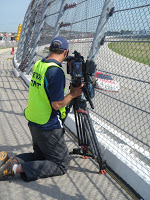 Go To Team’s Charlotte, NC based DP Skip Clark was just in Bristol, TN covering the Dollar General presence at the Sharpie 500. Bobby LaBonte and Delana Harvick were there signing autographs and giving away door prizes. “It was a hot day in Bristol, but we stayed cool in the air conditioned tent and drank lots of water!” -Skip Clark.